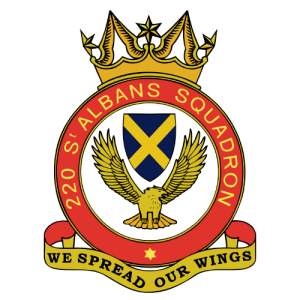 Hello – and welcome to the official website of No.220 (St Albans) Squadron Air Training Corps. The Air Training Corps (ATC) is a major national youth organisation, affiliated to the Royal Air Force, with more than 900 units across the UK. We are the unit serving St Albans and the surrounding area and currently we have more than 40 cadets, aged from 12-19. The ATC operates in communities alongside the Combined Cadet Force (RAF Section) which operates in schools. Collectively we form the Air Cadet Organisation, which is commanded by a senior Royal Air Force officer and has its headquarters at Royal Air Force College Cranwell. Our squadron is part of Hertfordshire and Buckinghamshire Wing ATC and we often take part in competitions, activities and events with members of our fellow Squadrons across the area. No.220 (St Albans) Squadron boasts a proud history, having been part of the city since 1941 – but whilst our past is important to us, it’s the future that matters most. We are always looking for new cadets to join our ranks, so if you – or your son or daughter – are interested in getting involved then please do follow the “Contacts” link and get in touch. And if you have any questions about us then we would love to hear from you too. 220 - St Albans Squadron Air Training Corps shared a post. The Tornado FINale flypasts will be taking place next Tuesday, Wednesday and Thursday, weather and aircraft serviceability dependent. Please take a moment to look at the following maps to find out where you might be able to catch a glimpse of her to say your own Farewell. An idea of timings will be published later. We would love to see your photos of her as she passes by. On the day of each flypast we will start a post that you can add your photographs to, so make sure you have your cameras ready.